How to enable additional logging for SMTP sessions from the IdP. OTPHtmlEmailProvider.Send, Exception: Failure sending mail. In such circumstances and where it's desirable to see the actual SMTP commands and the responses from the SMTP server, it's possible to turn on trace logging in .NET to capture the SMTP sessions. 2. Select the relevant realm and click the Decrypt button. 3. Next go to the realm folder, e.g. 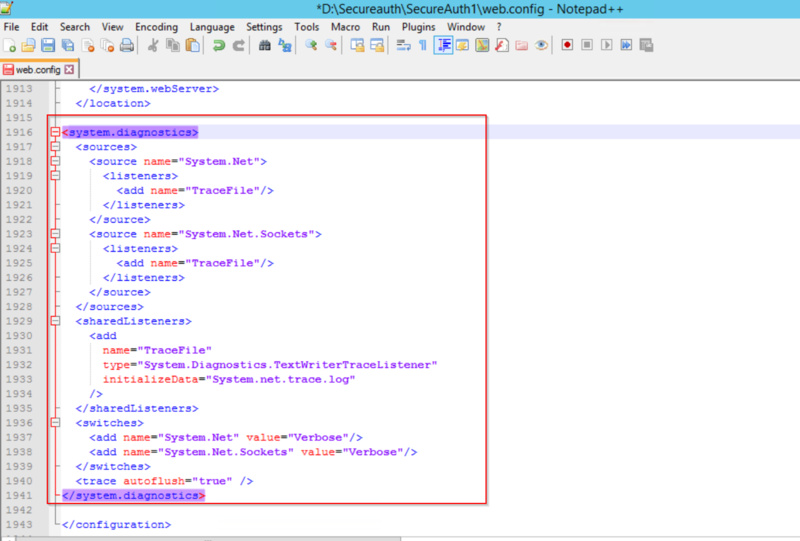 : D:\SecureAuth\SecureauthXX and make a copy of the web.config file. 4. Edit the web.config in a text editor and scroll down to the last line. Insert the contents of the attached file just above the final line, where it says </configuration>. 5. Once complete, save it and encrypt the web.config . 6. If it's working then a new log file called System.net.trace.log will be created in the realm folder once email is being sent from the realm.